I have never roasted a coffee that actually smelled like plums while it was roasting, until I roasted Burundi. If I had to pick one coffee that I think makes perfect espresso shots, this is it. I roast it dark, but those plum notes carry through, making the back taste sweet and fruity. I prefer this, as I usually drink my coffee and espresso black. Full City, or medium roast, seems to be what connoisseurs of fine coffees are recommending as I roast for this coffee, so that the vanilla, nut and citrus notes are carried through, but even as a darker roast the overall taste is still a juicy raisin, plum, blackberry sweetness. The aftertaste still yields enough dark chocolate to define a typical and exceptional African coffee taste profile. I like the darker roast, as again, I prefer dark and sweet, and the medium roast did not give me enough weight in the cup. Either roast, however, is a creamy cup. 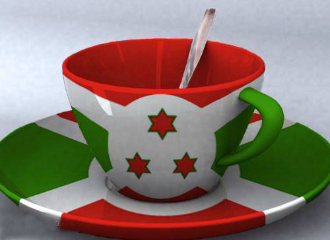 Burundi, by the way, is located near Rwanda and I must mention that the best cup of Swiss Water Decaf coffee I ever tasted was from Rwanda. I hope you enjoy this new Java as much as I.